It’s been about a year since we restored our pond and I’d like to share with you just how well it has developed in such a short time. I expected it to attract wildlife, but I didn’t expect it to happen so quickly or for it to be so easy. 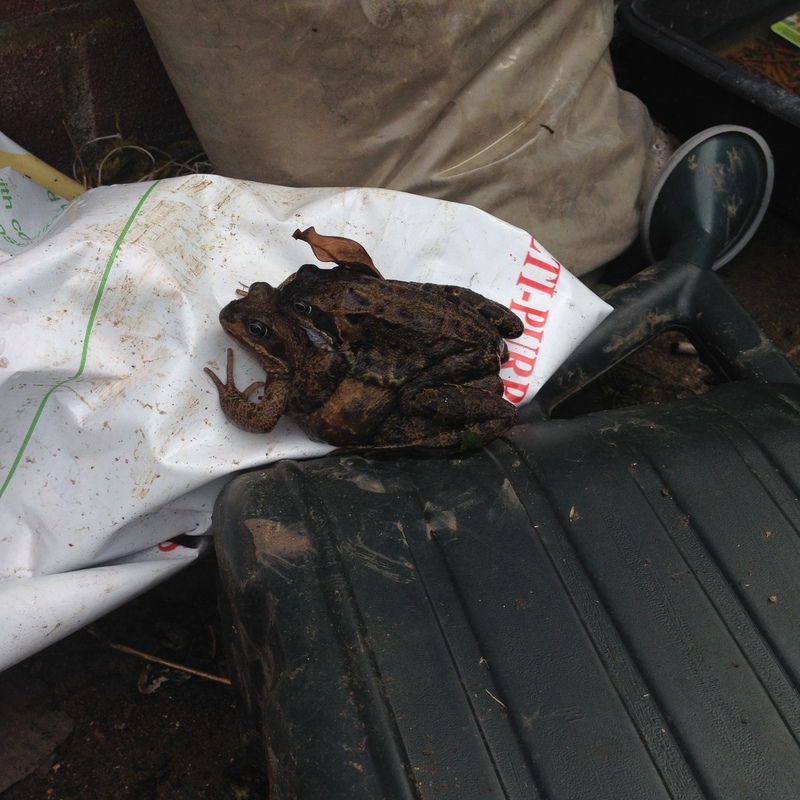 The first real signs of life were a couple of frogs we discovered on the patio in mid March. We were excited and expected to see frogspawn the following morning, however it was a few weeks before the first batch arrived. My daughter had made checking for frogspawn part of her morning routine before school, and on 2nd April she came running in screaming with excitement. That same day we found another two frogs paired up on the patio, and the next morning before breakfast we discovered that our pond was teaming with amphibians all fighting to pass on their genes – some more successfully than others. In total I counted 30 individuals, although I am pretty sure there were more; the pond was so busy it was difficult to count them all. When all the activity had died down, the spawn eventually covered a third of the pond edge. One problem we did have with this influx of frogs is that the crows which live in the trees at the end of the garden suddenly had easy dinners and unfortunately a few frogs didn’t quite make it. So in an attempt to keep the frogs safe, we built a makeshift scarecrow which seemed to work. One the 1st May we spotted our first tadpoles. 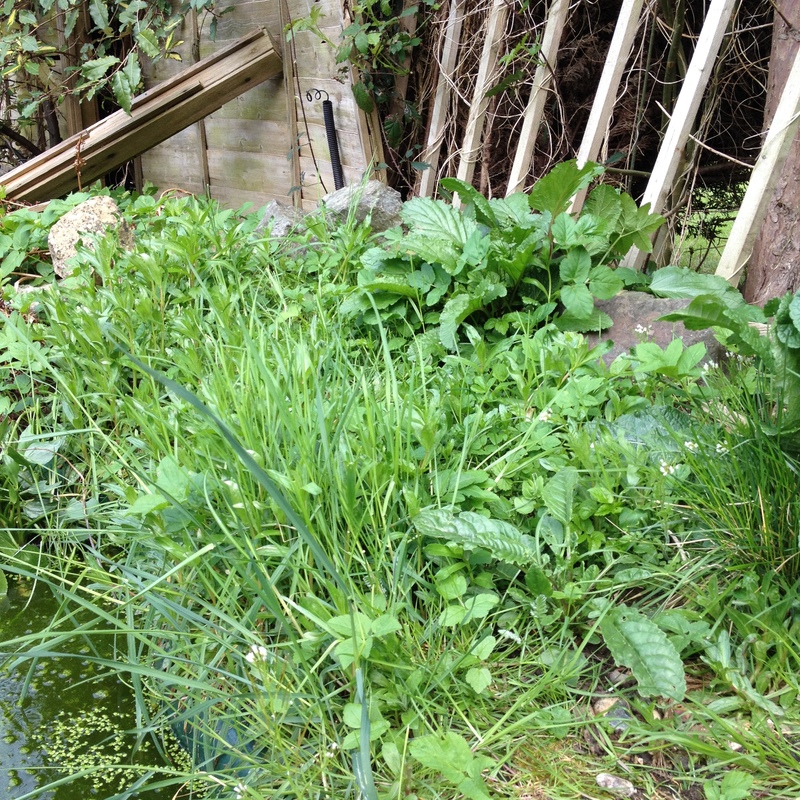 While the tadpoles matured and eventually left the pond, the vegetation which I had planted in August last year was beginning to grow and would eventually provide cover for the emerging froglets, as well as supplying nectar for foraging bees and other insects. 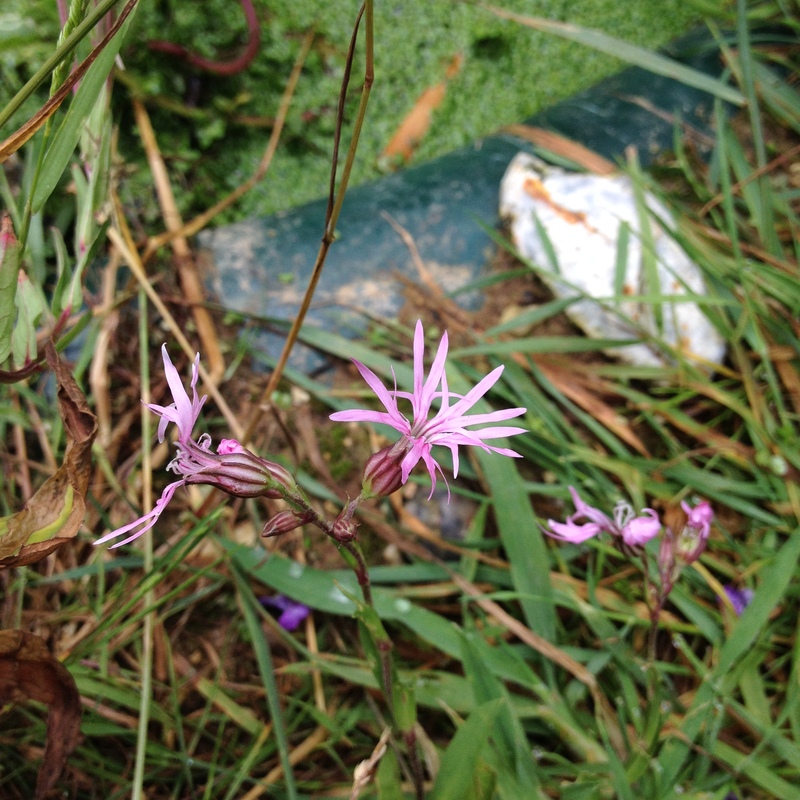 I’ve been asked before what plants work well to plant around the edge of ponds, and I always respond with native species such as those below. 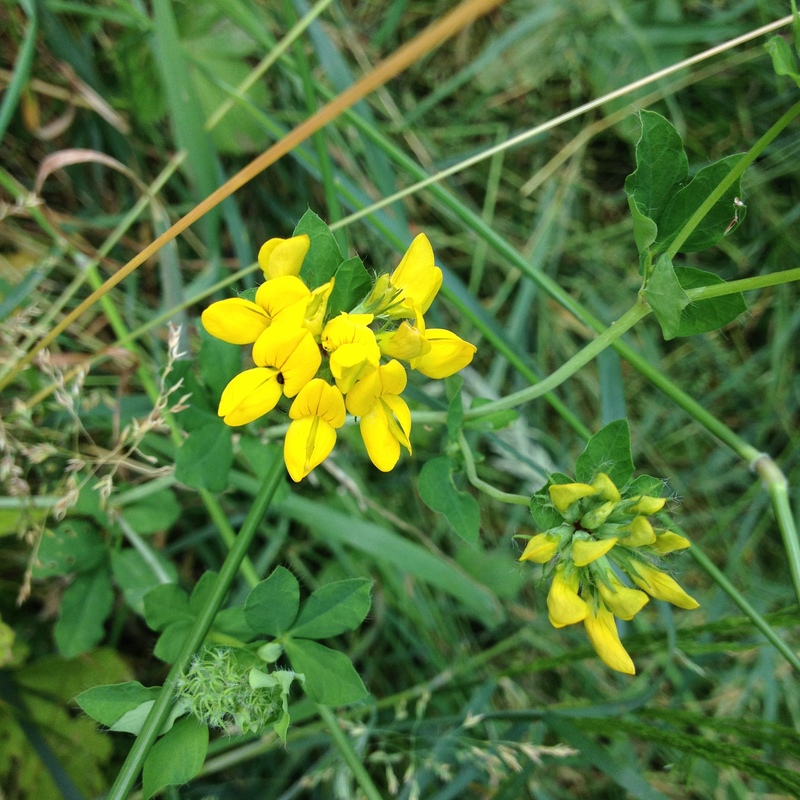 I think we have such a beautiful range of native wetland species that there is no need for any others – but this is of course my preference, and I am sure there are many other marginal plants out there. 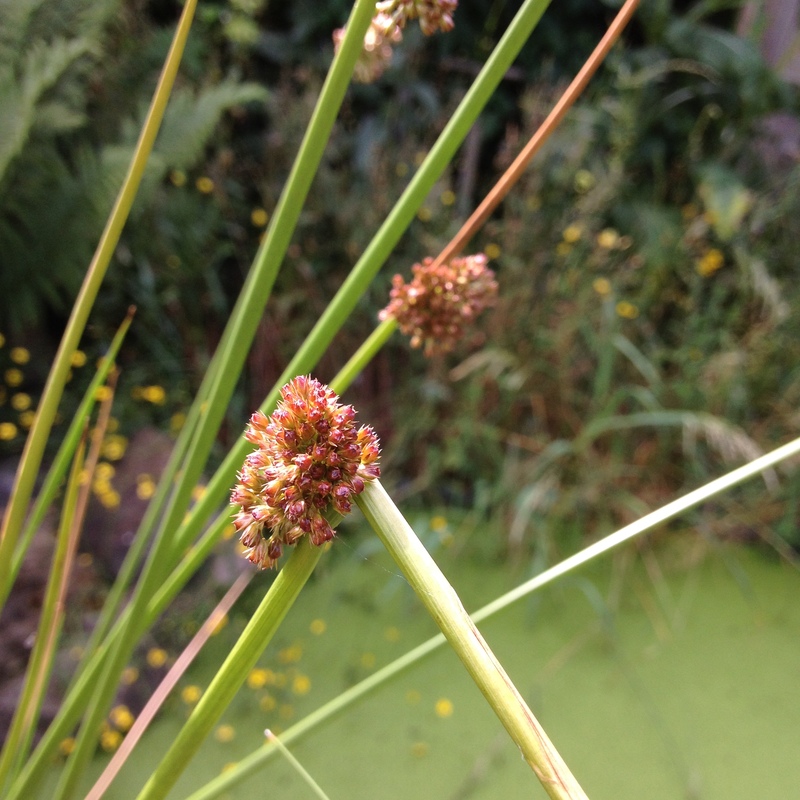 One thing to remember though is that some aquatic plants which are introduced can become invasive if they escape into the wild such as parrot’s feather Myriophyllum aquaticum which is now banned in the UK as well as four others. 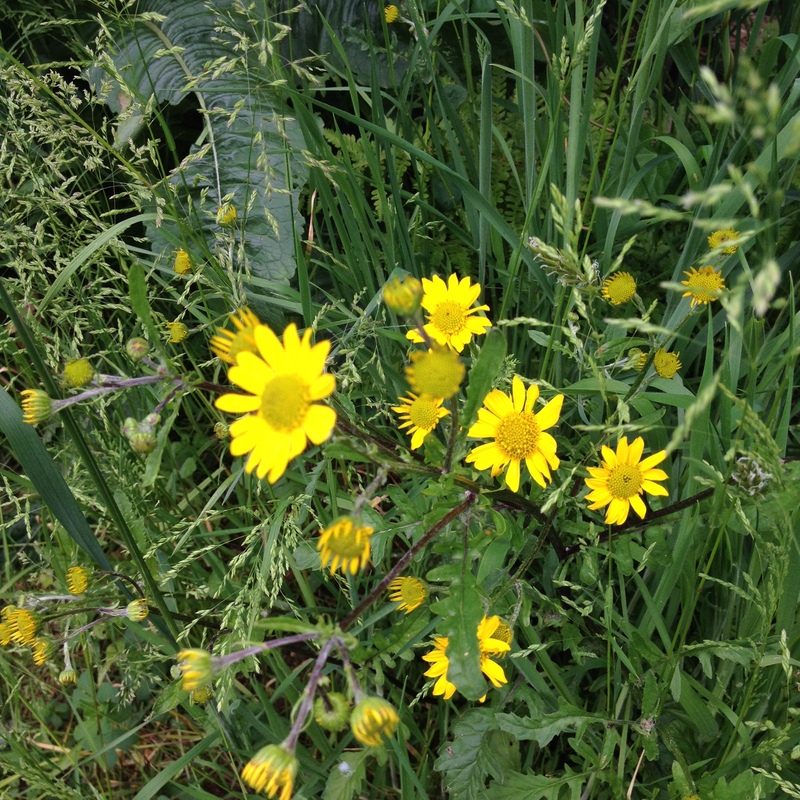 If you do grow non-native aquatic plants, do not dump them into any wild waterways. 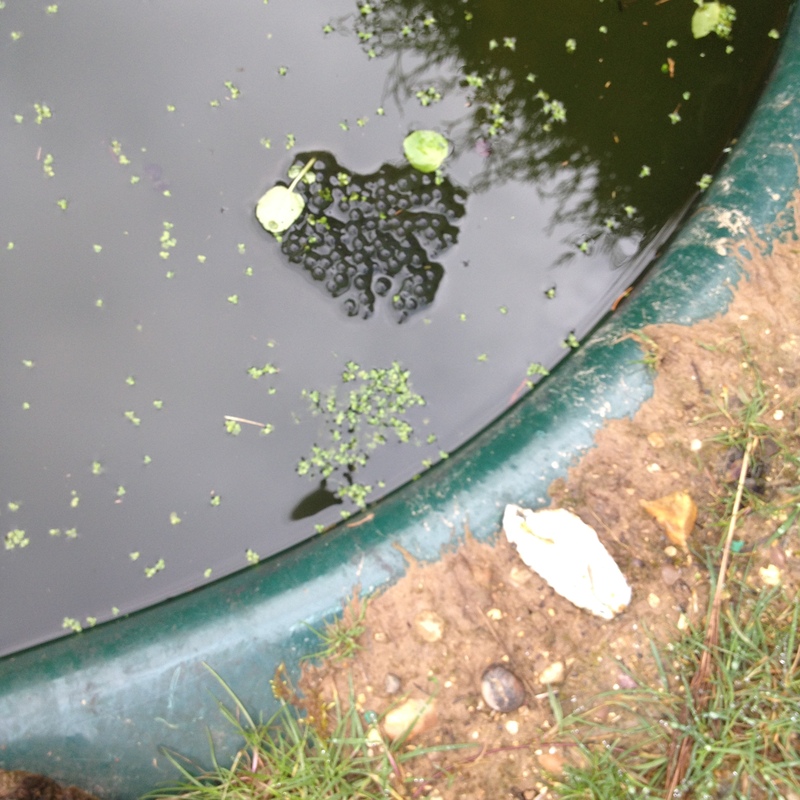 One problem I have had with the pond is the thick blanket of duckweed. 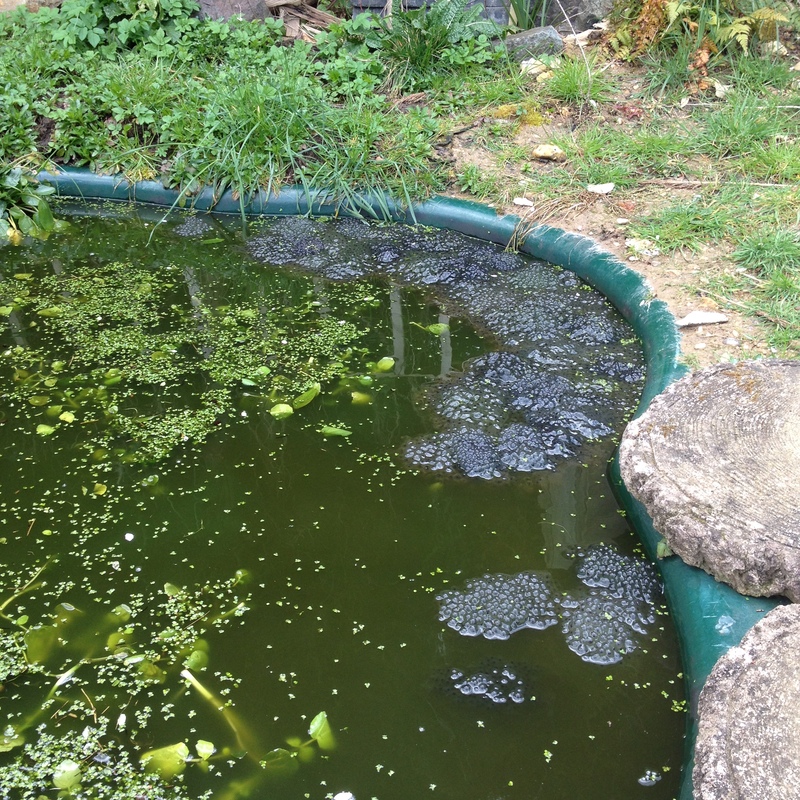 A little duckweed is fine, and is probably a good thing, but unfortunately the nutrient levels were increased in our pond after my daughter ‘fed’ the tadpoles about 50 slugs and snails! I noticed that the tadpoles were coming up for air a lot more than they should one day so I began clearing the duckweed using a large holed tennis racket, carefully picking out any creatures such as rat-tailed larvae and water louse. I had to do this every other week or so, as and when the duckweed regrew. I also added in some oxygenating hornwort to help the tadpoles. 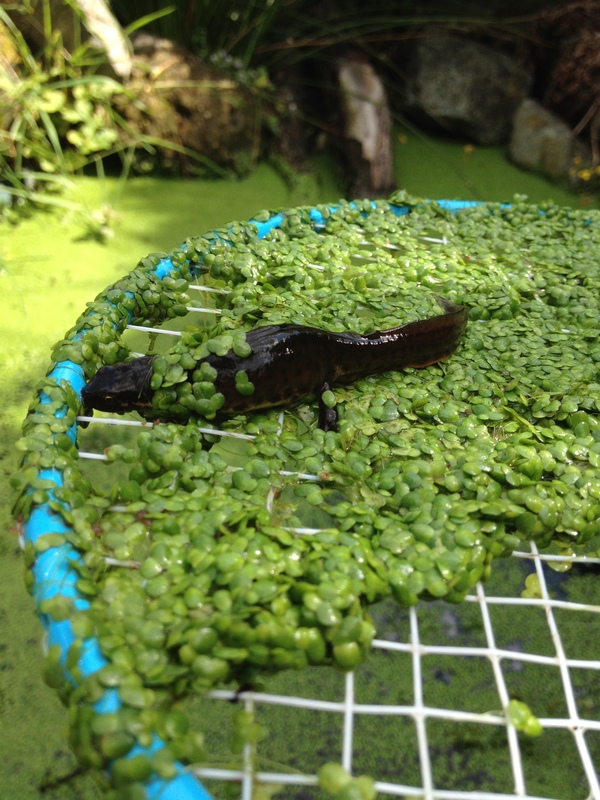 One day when clearing out the duckweed I made a discovery which made my day. I had caught a newt! A very large, male smooth newt Lissotriton vulgaris. 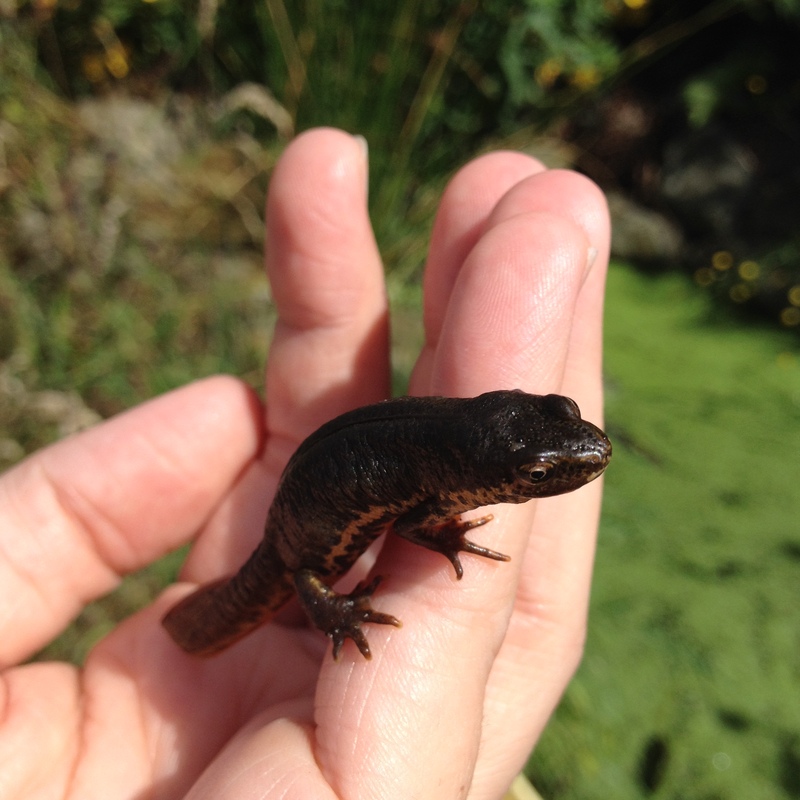 Part of me had hoped he was a great crested newt, but I was still happy to have found another new resident of the pond. 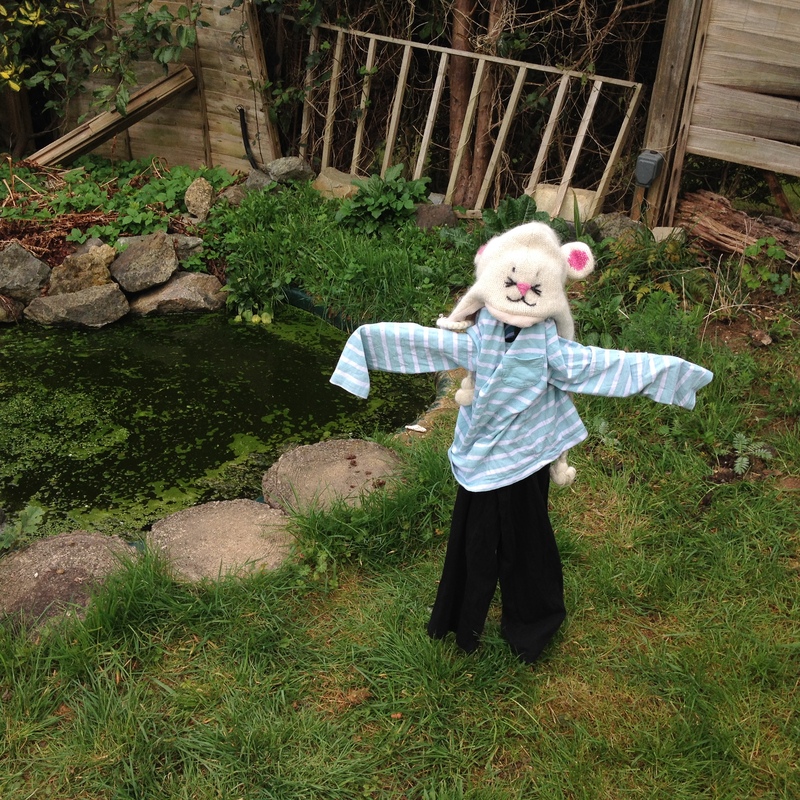 Having a pond in the garden is great for curious kids. 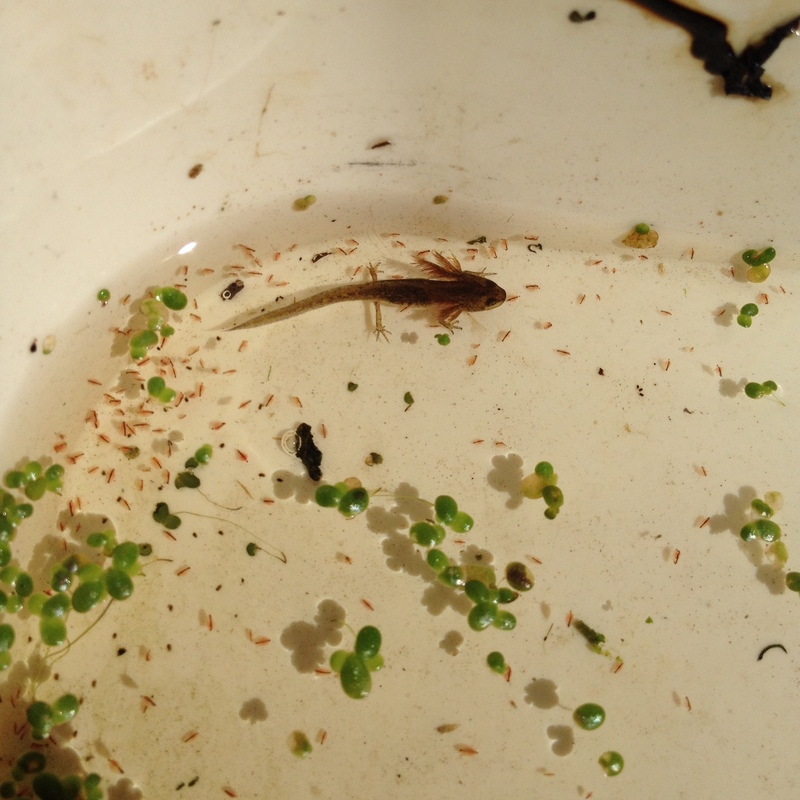 My daughter loves pond dipping with me and we have discovered large dragonfly and damselfly larvae, rotifers, may fly larvae, small diving beetles, water louse, blood worms, pond skaters and most recently, a newt eft which shows that the frogs aren’t the only ones breeding in the pond. 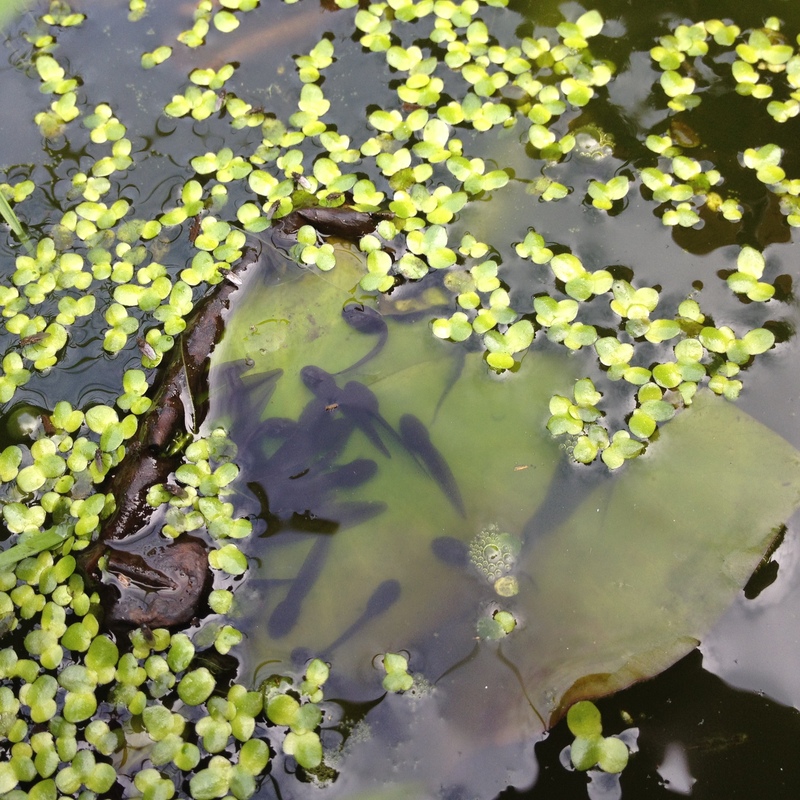 It is worth noting that when removing duckweed, to also check for newt eggs too. The pond is also visited by different Odonata – the family to which dragonflies and damselflies belong. 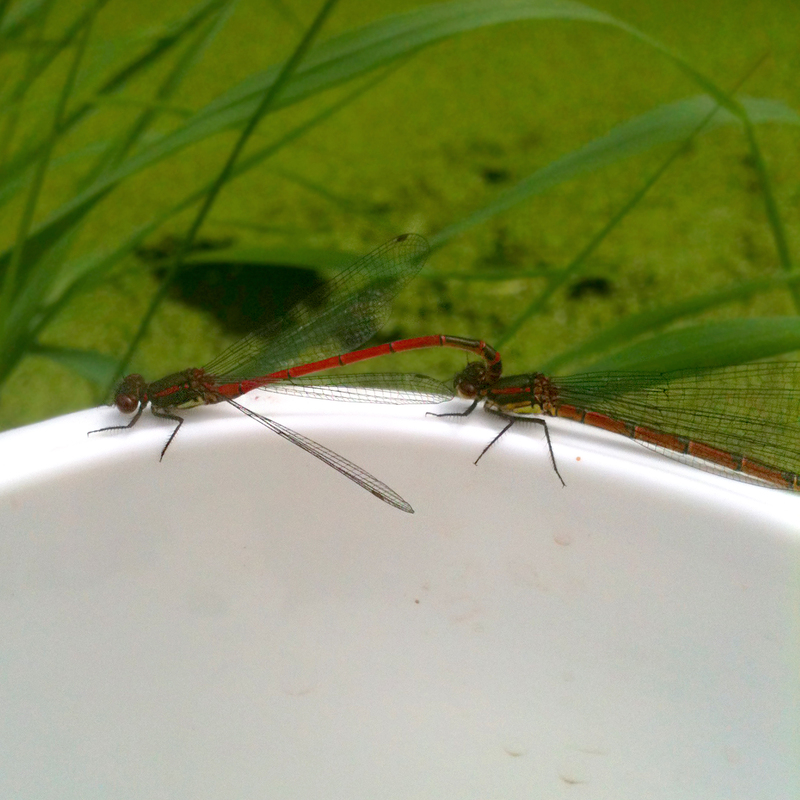 Last year just shortly after the pond was restored we saw dragonflies laying their eggs in the water. 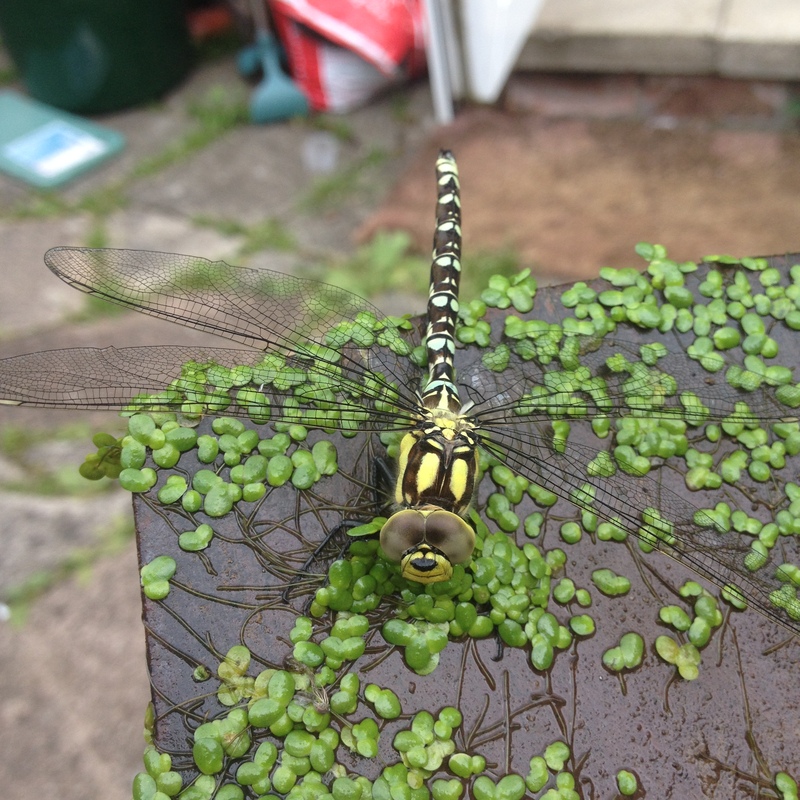 This year, we have seen a few different species of Odonata including the large red damselflies Pyrrhosoma nymphula and the southern hawker Aeshna cyanea dragonfly. 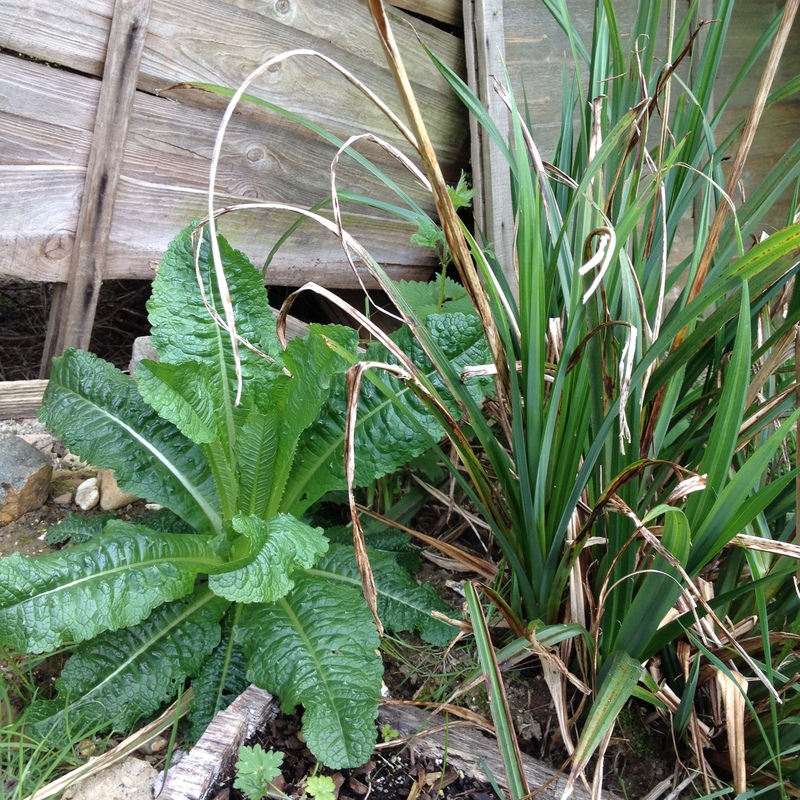 I am sure that this is just a fraction of the wildlife which has benefitted from our pond. The foxes come and drink from it each night and the bats feast on the emerging midges above the water. 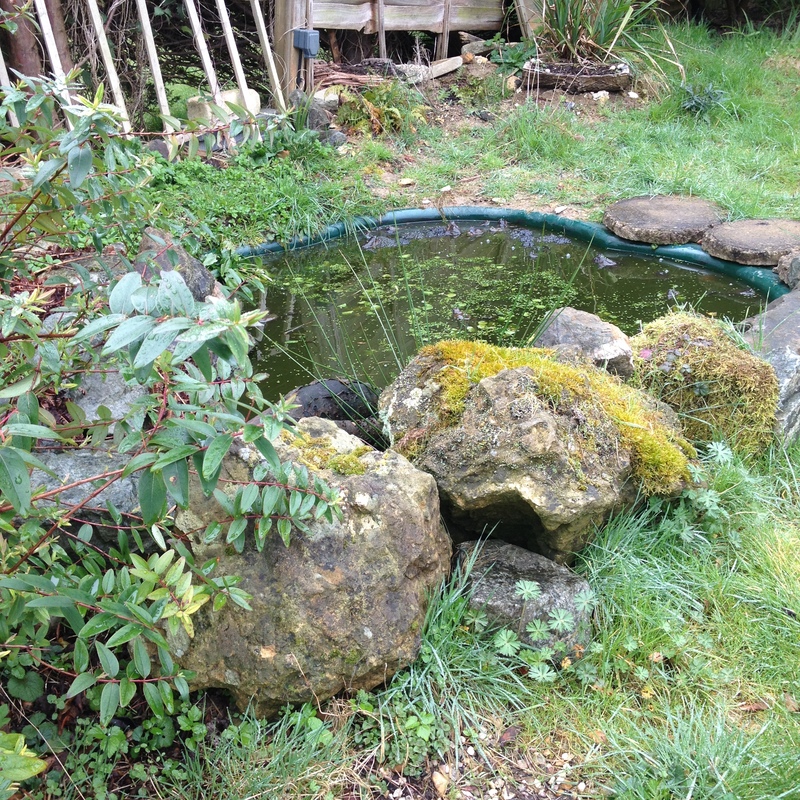 The pond provides nourishment, a home, and a place to breed for creatures large and small and I look forward to seeing what the next surprise will be. 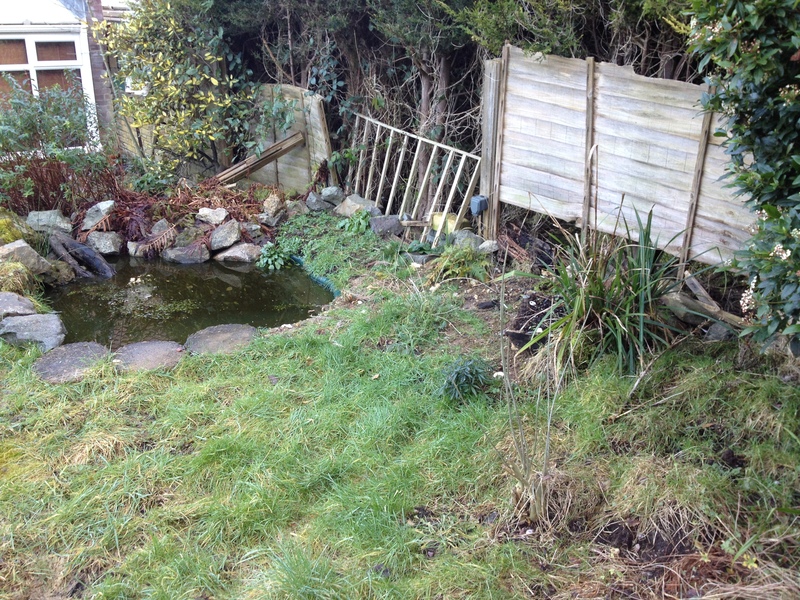 If you have a pond in your garden, I’d love to hear what wildlife it has attracted. Comment below or get in touch through twitter or facebook. Fantastic! It’s teaming with life. My pond draws a great many birds and insects but amphibians are in short supply in Southern California. I put goldfish in there to take care of mosquito larvae, mission accomplished. I’ve had a single racoon in the three years since who subsequently ate all my goldfish. Easy to replace and I’d rather have him go after my fish instead of my chickens! 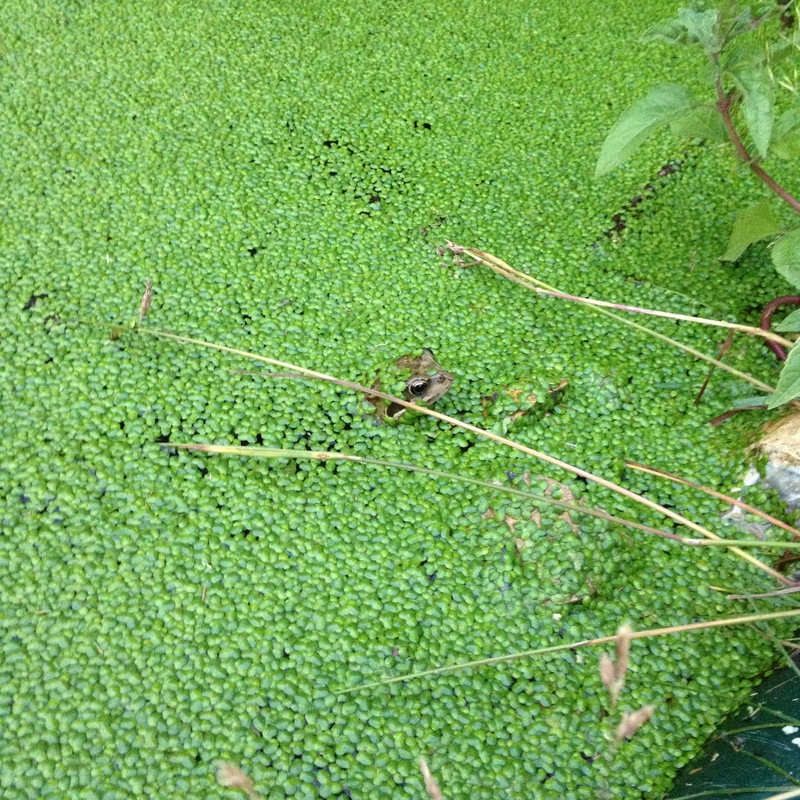 I’ve been avoiding the duckweed because of how invasive it is. But I do need to add some more plants in there to help cool down the water as well as provide some filtration. I currently have one taro plant in there that isn’t thriving too well. I do get hummingbirds every morning taking baths in the upper waterfall which is a wonderful morning treat to watch. I am envious of your amphibians though, one of my favorites. I adore little newts and salamanders. Your garden sounds lovely, how fantastic that must be to be able to see hummingbirds bathing each morning. I think we can take for granted the wildlife on our doorstep, and sometimes forget the fascination of the first time we saw them. I am always reminded of this when I do pond dipping with children when each child squeals with excitement when they see a humble tadpole. It’s true, we do sometimes forget. I force myself daily to stop somewhere and observe some type of critter. Big or small. I had a “conversation” with an angel wing katydid the night before last. Found a wp3 file of its mating call and we did call and response for a spell. Then she fly over to a hanging planter by my head to check out this handsome gentleman caller. I may have not been what she was expecting though, as she hasn’t called back in two days.